This product carries a lifetime warranty against mechanical failure or corrosion. It can be exchanged for an identical item or a similar item as determined by Unplugged Performance. It may not be returned for cash or credit. There is no warranty regarding surface imperfections or aesthetic damage incurred during regular use, and/or damage to the brackets from an impact or other unusual driving circumstance. By installation or use of this product you understand and agree with the following. If you do not agree, do not proceed with installation and return this product within 30 days for a full refund of the purchase price from the company from which you have purchased. I understand and agree that this product is intended to be installed for use on private roads and in jurisdictions where the use of this product is deemed legal by the local authorities. Furthermore I understand and agree Unplugged Performance does not have any knowledge or control of regulations in my local jurisdiction and it is up to me to determine if the product is acceptable for use with my vehicle. I understand and agree that this product affects the ride height of the vehicle and may make the vehicle more susceptible to damage from road debris, dips, inclines and other road hazards. Furthermore I understand that ride height adjustment may make the vehicle perform differently in emergency scenarios or in the event of a vehicle crash or impact. Furthermore I understand that Unplugged Performance has done testing of this product on road and on closed race tracks but does not have the ability to test the vehicle for localized standards and regulations. I understand and agree that lowering my vehicle will, in certain circumstances, require a different driving style and reduced speeds. I understand and agree that if the vehicle manufacturer determines that the lowered ride height contributed to a problem with the vehicle it may affect the vehicle’s warranty. Furthermore, I understand and agree that Unplugged Performance has no duty nor ability to be involved in internal manufacturer decisions. I understand and agree that if this product is given to an installer for installation on my vehicle, I have read and agreed with all of the previous, even if I myself am not personally installing these parts on my vehicle. Furthermore, I understand and agree that this product should be installed by a trained professional that is familiar with both the vehicle as well as this product in particular. 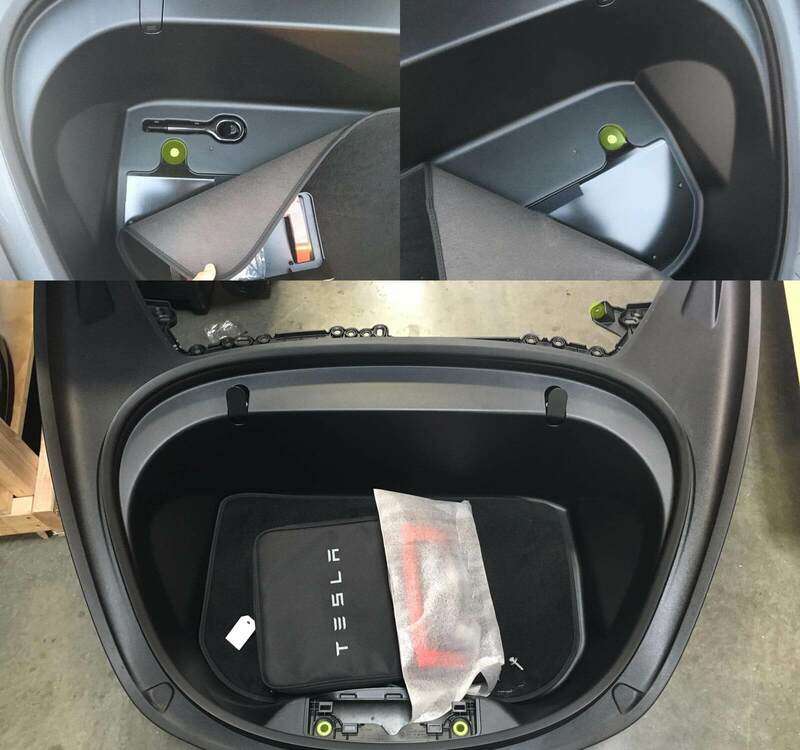 Furthermore, I understand and agree that I and/or my chosen installer will follow the installation instructions carefully and dutifully test the vehicle post-installation in a safe and controlled environment to ensure that it is operating properly. I understand and agree that by installing this product Unplugged Performance and all associated persons and entities as well as the vehicle manufacturer and all associated entities must be held harmless in the event of any suit, damages, or other legal action. Furthermore, I hereby release Unplugged Performance and any associated entities from any and all liability for any potential claim or claims. If you do not agree with any of the above statements you should return the product immediately. The vehicle must be lifted completely off of the ground and remain as such during the entire installation process. Next, flip up the small caps (FIGURE-1 YELLOW) and remove the two 10mm bolts. 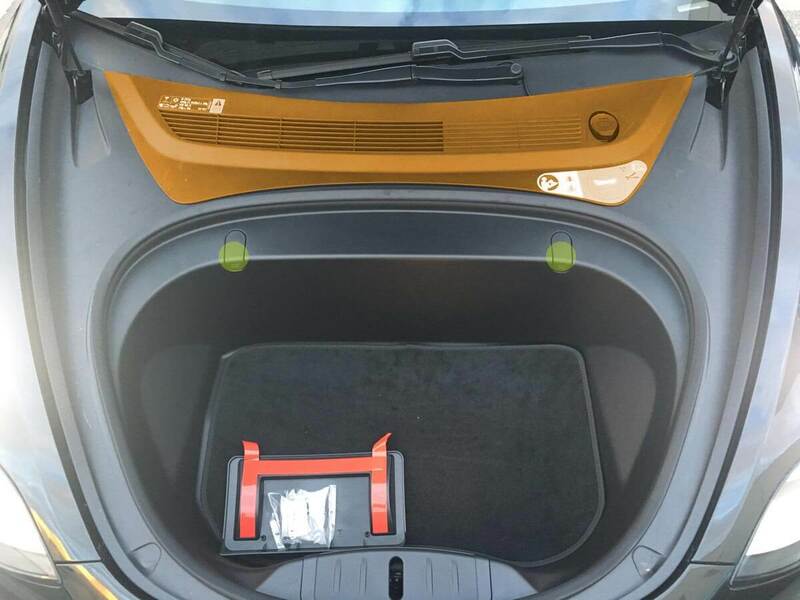 Remove the front trim panel and lift up the rug and find the additional 10mm bolts securing lower section of the frunk tub to the chassis and remove them (FIGURE-2 YELLOW). Remove the nut attaching the sway bar end link to the damper assembly (FIGURE-4 GREEN). Remove the bolt attaching the damper assemby to the lower control arm (FIGURE-4 BLUE). 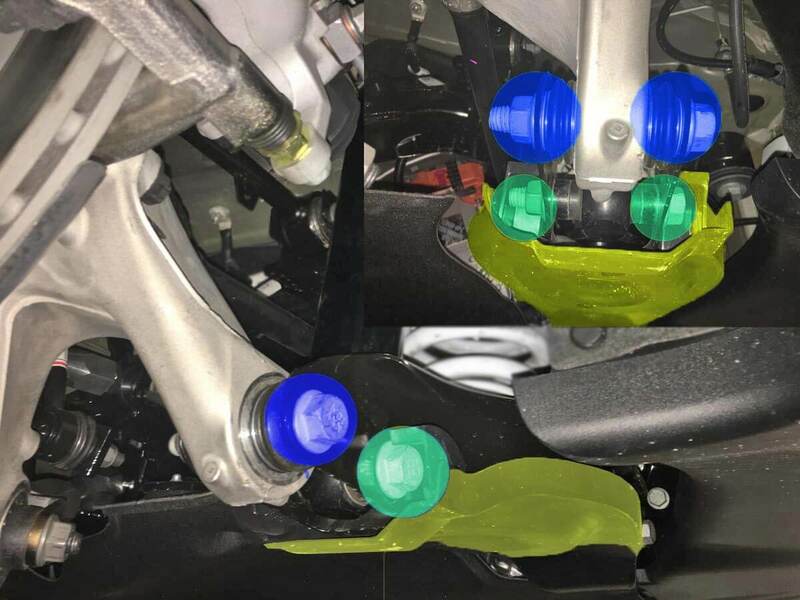 To complete removal of the front shock assembly, remove the bolt and nut clamping the front upper A-arm’s ball joint to hub / carrier (FIGURE-5 YELLOW). Remove the three nuts securing the top mount of the shock to the front upper control arm mount (FIGURE-7 ORANGE). Set the upper control arm + control arm mount aside. Next the OEM springs must be compressed and secured prior to removal of the damper's top mount. 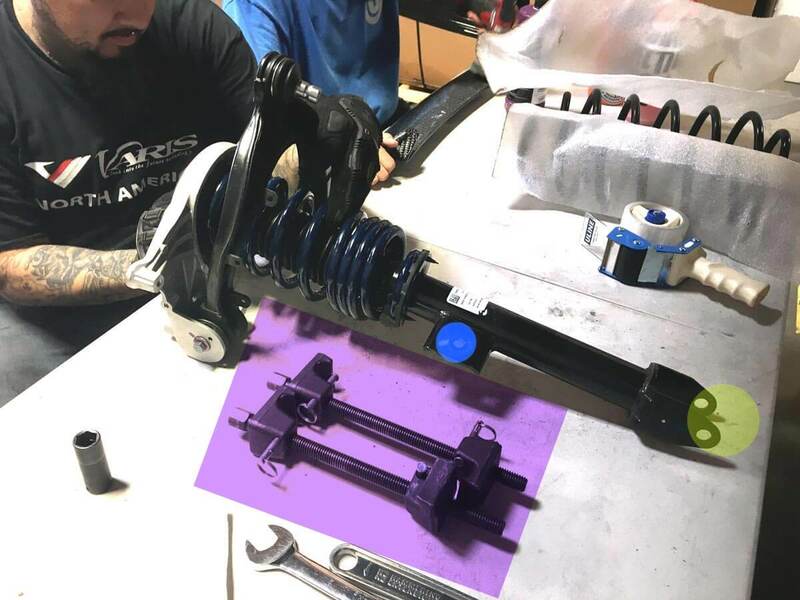 NOTE: A SET OF COIL SPRING COMPRESSORS IS RECOMMENDED (FIGURE-6 PURPLE). 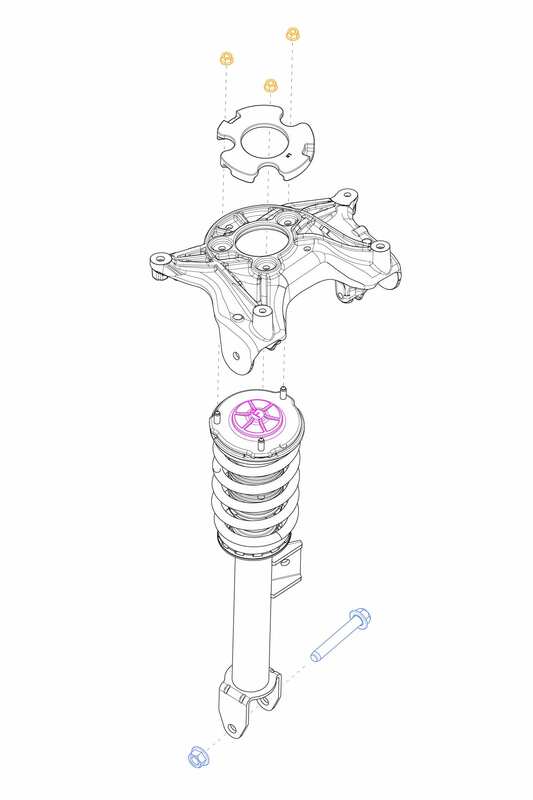 Once the springs are securely compressed, remove the top dust cap (FIGURE-7 PINK), to access the nut securing the top mount to damper assembly. Remove this nut to release the top mount. 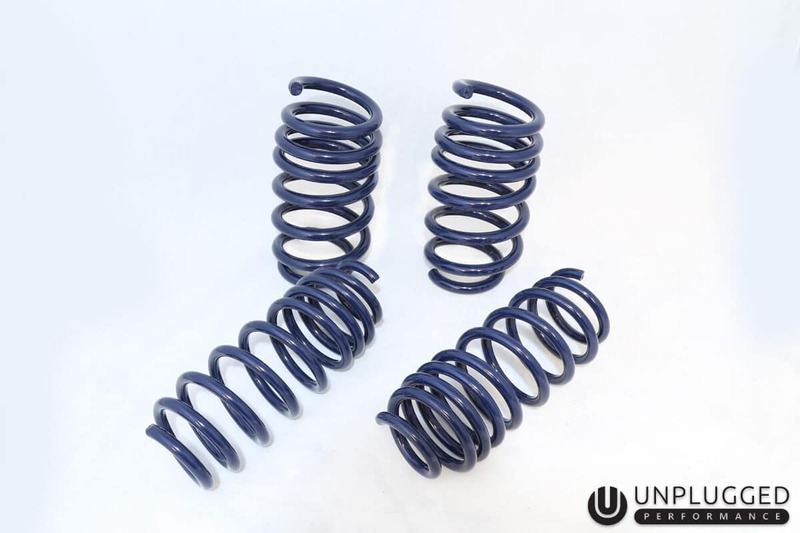 Next carefully remove the spring compressors from the OEM springs and transfer them to the U.P. Dual Rate Lowering Springs. 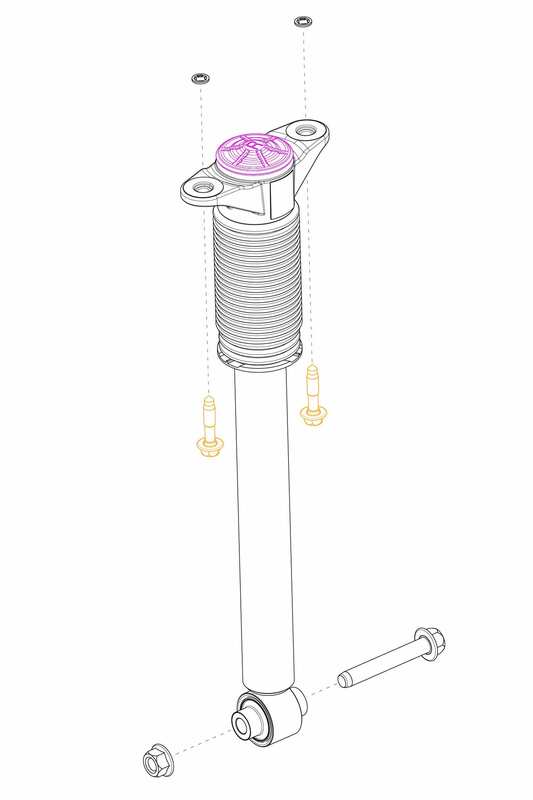 Follow steps 2 & 3 in reverse to reinstall the spring and shock assemblies. 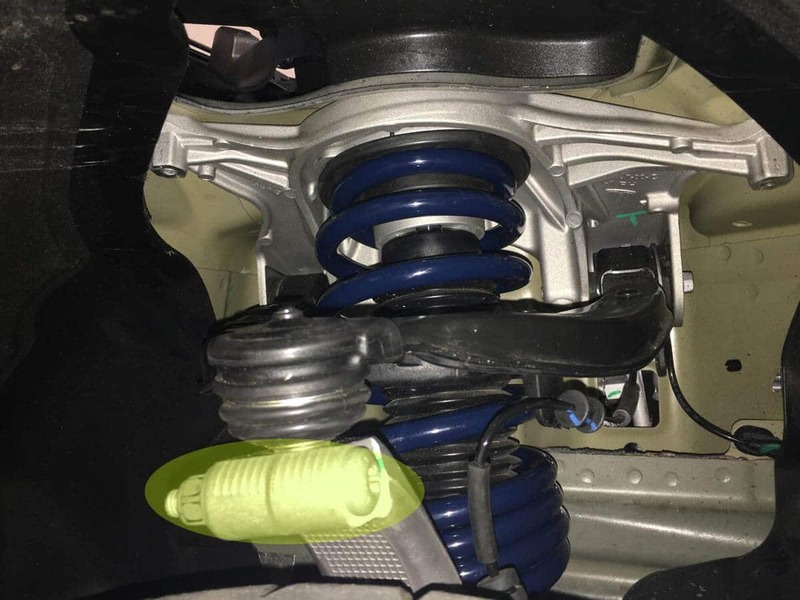 To remove the rear spring, begin by removing the protective plastic cover from the rear control arm / spring perch (FIGURE-11 YELLOW). 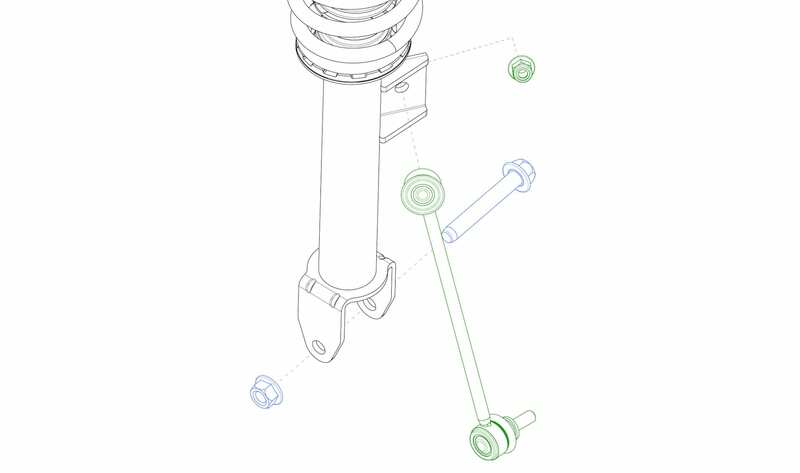 Using a transmission jack, apply upward pressure to the underside of the control arm / spring perch to slighly compress the rear spring. 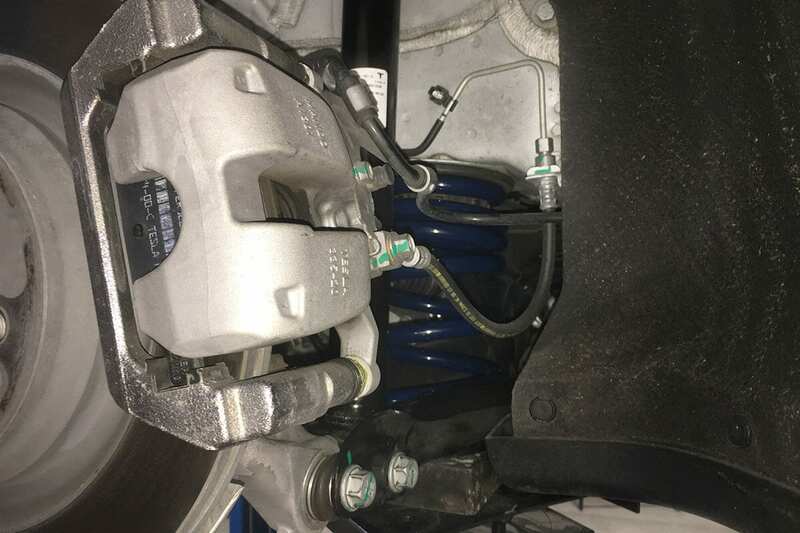 With pressure still applied, remove the bolt and nut securing the control arm / spring perch to the hub (FIGURE-11 BLUE), as well as the bolt and nut securing the bottom of the shock to the control arm (FIGURE-11 GREEN). Once the bolts are remove, slowly lower the jack to gently uncompress the spring (the spring will need to be fully uncompressed - no tension). 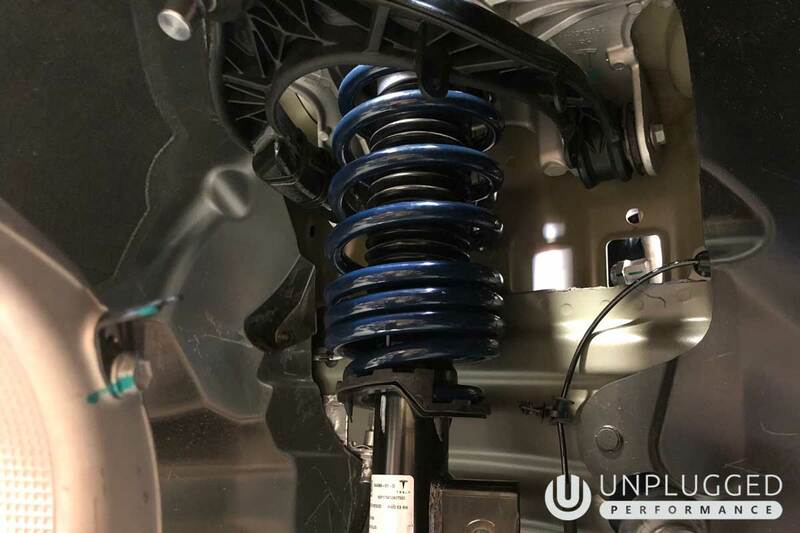 The OEM spring should now be loose and capable of being removed. Next, loosen the two bolts attaching the OEM damper to the vehicle's chassis and remove the assembly (FIGURE-12 ORANGE). 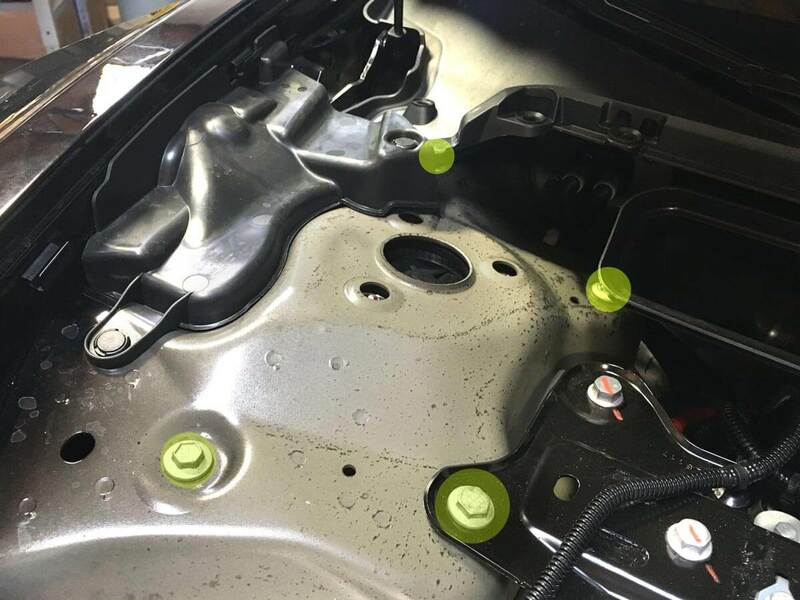 You will need to reuse the factory top and bottom rubber insulator pads (FIGURE-12 GREEN) when installing your new U.P. springs. 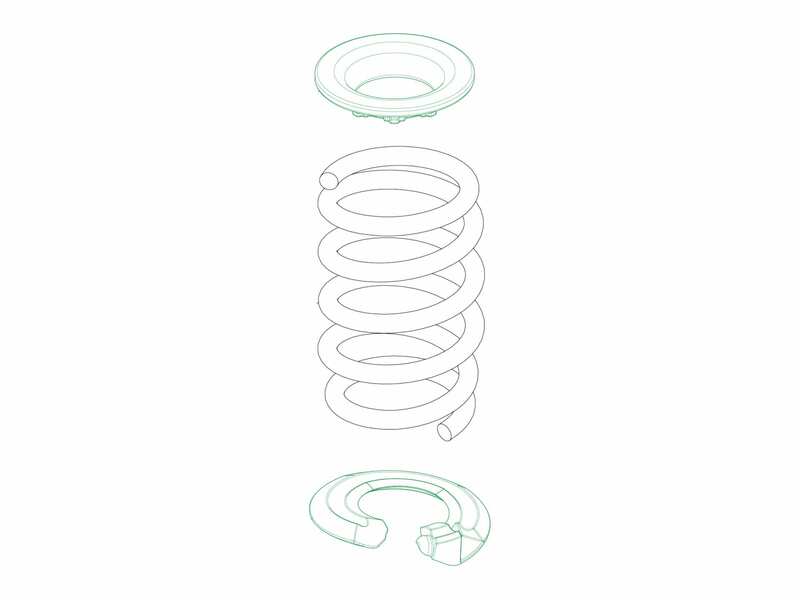 **Be sure to install the spring and insulators in the correct orientation! Using the jack, lift the OEM spring bucket until the bolts for the rear dampers, as well as the hub can be reinserted. Reattach nuts and tighten (recommended torque 85 ft⋅lb / 115Nm). Congratulations on your new springs! 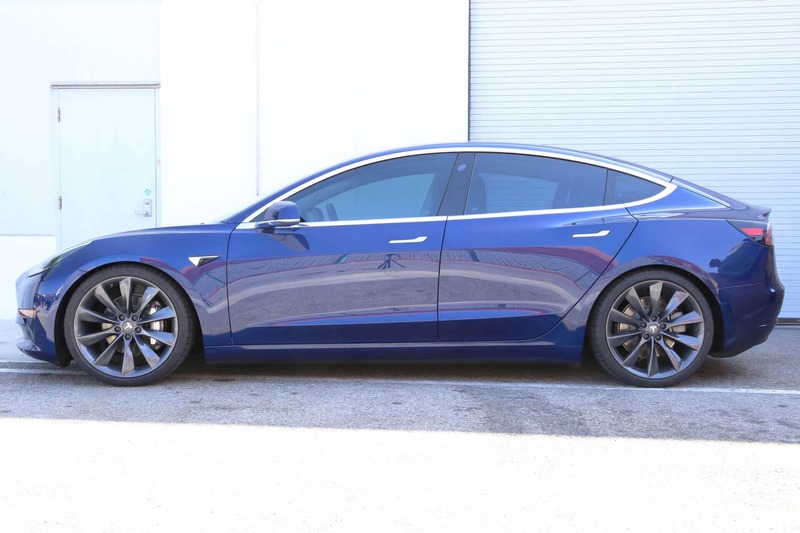 TESLA, TESLA MOTORS, and all related brands, marks and intellectual property including but not limited to TESLA ROADSTER, MODEL S, MODEL X, and the “TESLA,” “T” logos designs are trademarks or registered trademarks of Tesla Motors, Inc. in the United States and other countries. Unplugged Performance has no official relationship with Tesla Motors.